The Dry Creek Valley is home to the vineyards that have been passed down through five generations of one family that has proudly worked the land for over 150 years. 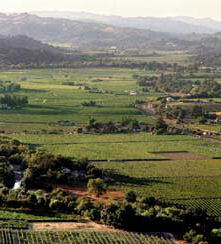 Seventy-five acres are planted to four clones of Cabernet Sauvignon, Merlot, Malbec, Petit Verdot, Zinfandel, Petite sirah, Chardonnay, Sauvignon blanc, Sauvignon musque and Viognier. TRUE -TO -TYPE VARIETALS: As winegrape growers, we produce six red and four white winegrape varietals with many clonal variations on varied rootstocks. We farm each separate block to produce the richest expression of that varietal using sustainable growing methods to enrich the soil as we are enriching varietal character. Our vines are cordon trained to minimize variability at bloom and set, trained to grow and ripen without excessive growth using reduced deficit irrigation and harvested at the peak of maturity. NEVER OVEROAKED: We ferment all of our varietals separately with select yeast to achieve the maximum gentle extraction of aroma and flavor compounds. This attention to detail in the vineyard and in the winery achieves the rich, fruit forward and harmonious blends that delight the palate. We preserve these appealing characters while allowing for normal barrel aging in French Oak. TRUTH IN LABELING: All of our wines are labeled with their varietal composition, either on the front or back of the label. We strongly feel that this information is vital to the appreciation of the character and distinctiveness of each bottle we make! During the blending process, it is always amazing to see how small 1% changes in composition can make or break a blend. We work hard on our blends to make them the best they can be! ATTENTION TO DETAIL: Every process in the winery is overseen by our winemaker, Janice Schmidt. Janice graduated from UCDavis with a M.S. in Enology and learned early that the smallest issues in the winery have to be managed properly to bring the fullest possibilities within each wine to each bottle. She is committed to scrutinize every process and every detail to produce the finest wines possible.